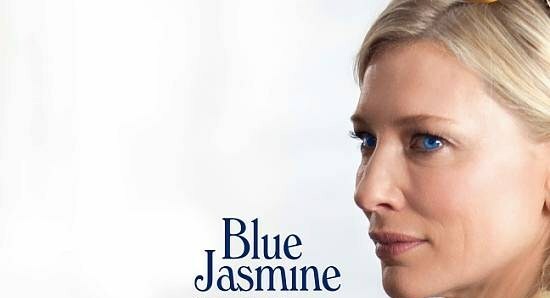 The opening strains of the elegiac and ruefully funny Blue Jasmine find New York sophisticate Jasmine French (Cate Blanchett, brilliantly playing at the intersection of elegance and schizophrenia) on a first-class flight to San Francisco that she can scarcely afford. While romantically reminiscing to the perfect stranger seated next to her, she proudly proclaims she is going West. This piece of dialogue caught my attention. I know Woody Allen has been getting out of New York more in his old age, with trips to Paris, Madrid, and London, but this is the man who famously pierced Los Angeles to its vacant, air-brushed core in Annie Hall. What kind of Allen surrogate would feel triumphant about leaving New York to go to California? It turns out my doubts were warranted. Jasmine, a delusional, now-penniless socialite, may sound eager about her odyssey, but the journey is really a miserable banishment. Jasmine lived an affluent life in New York with her dashing husband Hal (Alec Baldwin, all surface charm with nothing but empty avarice below it). She loved him with swooning devotion and they lived a life of soirees and charity balls. Then, one day, the dream came crumbling down when Hal was discovered to be a fraudulent criminal who had gambled with the fortunes of others and lost. Hal hung himself in prison and left Jasmine to suffer a nervous breakdown. Her assets are frozen and the same New York that was the setting of her fairytale now holds the humiliating prospect of old social acquaintances around every corner, so she has gone to live temporarily with her grocery clerk sister, Ginger (played by Sally Hawkins in a terrific supporting turn). The film takes place in present-day San Francisco, but repeatedly flashes back to Jasmine’s idyllic halcyon days with Hal and the lush lifestyle they shared together. The film’s flashbacks are not just narrative devices, but signs of Jasmine’s lack of connection to anything in the present. They are a means for her to literally burrow into the pages of an old storybook. In one flashback, we learn that Ginger once came to visit Jasmine with her blue-collar, ex-husband Oggie (Andrew Dice Clay, great in a smallish role). Ginger is a humble, salt-of-the-earth counterpoint to Jasmine, as sadly lacking in self-esteem as Jasmine is bewilderingly full of it. During their stay, Jasmine convinces Oggie to invest a windfall of money in one of Hal’s fraudulent business deals. It all went wrong and that devastating financial setback hastened Oggie and Ginger’s divorce. Blue Jasmine is Allen’s best film in years because it presents Jasmine’s romantic view of the past, but never forgets those like Oggie, whose lives were thoughtlessly destroyed by slick predators like Hal. Allen plunges us into a flailing society woman’s fond remembrances of her dead husband and their opulent life, but continually shows us the rot under the floorboards. Allen’s film is a melancholy jazz riff on denial, with Blanchett wailing furiously over it. In those flashbacks, Allen taps into an aristocratic, quintessentially East Coast vision of privilege. Jasmine believes she has been cruelly exiled from a kingdom of benevolent oligarchs. She is a tourist lost in average America, homesick for her fallen land of philosopher-kings. Jasmine clings to the idea that men like Hal deserved their lofty perches because they worked for them, knew how to handle them, and occupied them with a sense of sophisticated grace that those outside the walls would never properly value. Allen shoots these flashbacks as if seen through a thin layer of honey. They evoke the way all that wealth must have looked and felt to Jasmine. How the world must have felt just right, the way one’s skin probably feels in the comfortable cool of a late afternoon garden party, when the waning Hampton sunlight starts to make its goodbyes. The more we bear into the past, however, the more we become aware not only of Hal’s hypocrisy, but of the mental acrobatics Jasmine must have performed to keep reality from tarnishing her old-money fantasy. As the flashbacks pile up, Allen makes it increasingly difficult to shake the suspicion that Jasmine must have known something was amiss. What makes Blue Jasmine read as more than a mere harangue against upper-class fraudulence and wealthy delusion is that Allen’s darkly empathetic script and Blanchett’s blistering portrait of a woman out of time never let Jasmine turn into a rote caricature of selfish entitlement. She is certainly selfish and entitled, but there are also notes in Jasmine’s character that are bitter and poignant and hilarious. Allen’s film is full of the kind of acerbic laughs that get lodged halfway up your windpipe. Jasmine is vain and helplessly unsuited to live in this new world of cheap cafes and cluttered apartments. The life most of us lead is a tacky insult to Jasmine. She is absolutely nothing like the average person, and yet her disillusionment and shame make her an unexpectedly poignant spectre of post-recession melancholy. The look in her eyes when anyone defiles her loathsome husband’s memory fills us with a bone-deep sorrow for her. She knows now that Hal and the sweet storybook world he created for her are gone forever. The seaside castle of her reverie is now a crypt where the best moments of her life lie buried, but that desolate tomb is the only true home that Jasmine ever knew. The entire dream Jasmine envisioned for herself may have been built upon theft and deceit, but this does not change the fact that she can never go home again. Allen and Blanchett ground their beautiful, bleak duet in a healthy foundation of subtle feminism. As vain and obtuse as Jasmine may be, the film reserves its real vitriol for men. Blanchett’s scenes with Hal are transfixing because we can always glimpse the disgusting charade just beneath this paper man’s philanthropic, genteel veneer. We listen to him dribble privileged platitudes and watch him barely conceal his lust for other women; and then we look to her for any sign that she recognizes what we see. Ginger now dates Chili (Bobby Canavale, fine as a cocky lout), a braggadocious mechanic with none of the slippery superficiality we see in Hal. Jasmine dislikes him for his boorish, abrasive manners and we wonder if she is too classist and conceited to respect a simple, hard-working man. Later we begin to see that it may not be so simple. Chili may be more humble and genuine than Hal but he is also a hard-drinking, arrogant brute. He condescends to Jasmine in their first meeting, regards her career prospects with casual sexism, and nakedly disrespects the life she still pines for. Later, when Chili fears that Ginger will leave him, he grabs her roughly and rips her phone off of the wall. Ginger breaks up with him for a short while and tries to start a new relationship with a friendly, well-mannered sound engineer, but he soon shows himself to be a fraud in his own way. Allen maroons his two exceptionally strong female characters in an America where men of real integrity have fled. With the exception of the refreshingly unassuming Oggie, these men consistently mistreat and fail the women around them. But with egomaniacal charlatans on one side and chauvinistic vulgarians on the other, where are they to go? Allen and Blanchett leave Jasmine to absent-mindedly roam the alleyways between the bombed-out shell of old American privilege and the grey sprawl of America’s economic hangover. Jasmine is an exquisitely upsetting window into the hollow core underlying the romantic ideals of upward mobility and opportunity. When all is said and done, she is a woman who would rather wander the incinerated halls and scorched parlors of the old estate than start over in the vulgar tenements of whatever is left. 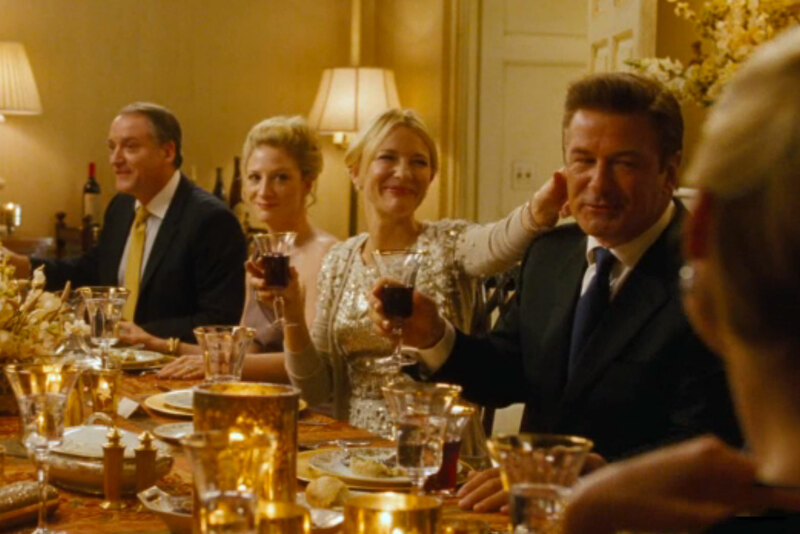 Blanchett does an outstanding job of making this fragile narcissist a relatable, pitiable, funny and tragically misplaced piece of an irreparably broken American dream. The fading ghost world of Jasmine’s tortured memories lay on a foundation of avarice, fraud, and the financial obliteration of a great many poor souls she never knew. People like Jasmine had no right to the life they enjoyed year after gluttonous year, but the damage was done because they had accepted what was given to them and licked the spoon clean. They had become hopelessly addicted to a drug that could never exist again. Their pushers had vanished, never to be seen or heard from. And whatever remained out there for them would never measure up.